(mit.edu/~thistle) A People’s History of the United States – The history of the last century is the history of oil. Due in part to catastrophes like the oil spill from the Exxon Valdez on March 24th 1989 and the recent increase in reporting on Global Warming, by now most people are at least passively aware of the environmental dangers involved with the world’s dependency on oil. According to Project Underground, the California based industry watchdog, petroleum exploration currently threatens old growth frontier forests in 22 countries, coral reefs in 38 countries, and mangroves in 46 countries. Keep in mind that this is just what is being destroyed while these corporate giants look for future sites to exploit. Given the incredible danger this industry represents to humanity, one might ask what kind of people would continue to push the world into ever greater use of petroleum products while simultaneously thwarting efforts to develop alternatives such as renewable energy sources. Well would it be any surprise that they would be the same type of people that would actively collaborate with the Nazis and the Japanese fascists during the second world war, or the types of people who today would employ military death squads against peaceful protesters? This space is far to short to give even a superficial introduction to the history of back room deals with dictators, violence, murder, and genocide which is synonymous with the history of oil, but just to illustrate my point I will briefly discuss some of the lower points in the history of Standard Oil and its progeny. The Standard Oil Trust was dissolved under court order in 1911 creating many smaller regional companies, including Standard Oil of New Jersey (Exxon), Standard Oil of New York (Mobil), Standard Oil of California (Chevron), Standard Oil of Ohio (Sohio), Standard Oil of Indiana (Amoco), Continental Oil (Conoco), and Atlantic Oil (ARCO). By 1941 Standard Oil of New Jersey was the largest oil company in the world, controlling 84 percent of the U.S. petroleum market. Its bank was Chase and its owners were the Rockefellers. J.D. 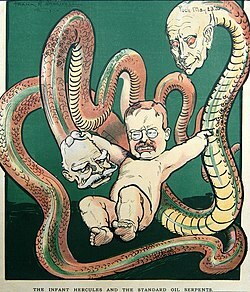 Rockefeller had always argued that two things were essential to the oil industry’s survival: checking “ruinous competition” and “cooperation.” Given the success of his monopoly at making enormous profits for its investors while at the same time destroying any form of competition and keeping prices artificially high, it seems quite clear whose survival he was really talking about. A brief aside is required here to explain what type of company I.G. Farben actually was. At the time, it was the world’s largest chemical company and through the talents of its scientists and engineers, it secured the vital self-sufficiency that was to enable Germany to maneuver in the world of power politics. From its laboratories and factories flowed the strategic raw materials that Germany’s own territory could not supply, the synthetics of oil, gasoline, rubber, nitrates, and fibers. In addition, I.G. produced vaccines and drugs such as Salvarsan, aspirin, Atabrine, and Novocain, along with sulfa drugs, as well as poison gases and rocket fuels. The depth of I.G. Farben’s connection to Nazi policy was finally realized at Auschwitz, the extermination center where four million people were destroyed in accordance with Hitler’s “Final Solution of the Jewish Question”. Drawn by the seemingly limitless supply of death camp labor, Farben built I.G. Auschwitz, a huge industrial complex designed to produce synthetic rubber and oil. This installation used as much electricity as the entire city of Berlin, and more than 25,000 camp inmates died during its construction. I.G. Farben eventually built its own concentration camp, known as Monowitz, which was closer to the site of the complex than Auschwitz was, in order to eliminate the need to march prisoners several miles to and from the plant every day. This was the company enthusiastically embraced by Standard Oil as well as other major American corporations like Du Pont and General Motors. I do not, however, state that Standard Oil collaborated with the Nazis simply because I.G. Farben was its second largest shareholder. In fact, without the explicit help of Standard Oil, the Nazi air force would never have gotten off the ground in the first place. The planes that made up the Luftwaffe needed tetraethyl lead gasoline in order to fly. At the time, only Standard Oil, Du Pont, and General Motors had the ability to produce this vital substance. In 1938, Walter C. Teagle, then president of Standard Oil, helped Hermann Schmitz of I.G. Farben to acquire 500 tons of tetraethyl lead from Ethyl, a British Standard subsidiary. A year later, Schmitz returned to London and obtained an additional 15 million dollars worth of tetraethyl lead which was to be turned into aviation gasoline back in Germany. etails, I am trying to generate a sense of the overall picture. It should also be recognized that I am just grabbing a snapshot of data, rather than the more detailed studies that look at the longer term, which folk such as Rembrandt, Rune and Euan provide. 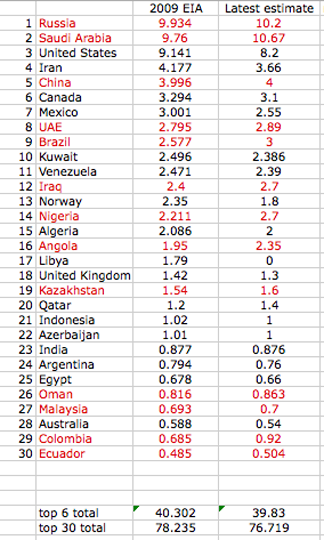 The simplest way to do this is to place my current estimates of production for the top 30 oil producers that I have reviewed in this series against the EIA estimate of their production in 2009. (The OilDrum) The impacts of the disruptions in the Middle East are now starting to become evident as supplies no longer flow into the delivery pipelines that carry fuel from countries such as Libya to their European customers. It is now considered likely that the 1.6 mbd that Libya delivers to the world market will not be available for some time. Ireland, for example, which has had other problems with the banks in the recent past, is now faced with the loss of perhaps 23% of its fuel supply, which while only 14 kbd is, for that country, likely to be very significant. For while the Libyan shortage at present may be just due to Gadhafi ordering the ports closed, if he is also ordering the destruction of facilities, as is rumored, then the consequences may be more long term. ENI has reported that the Libyan shortfall is currently 1.2 mbd.